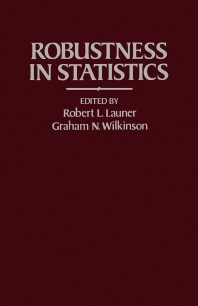 Robustness in Statistics contains the proceedings of a Workshop on Robustness in Statistics held on April 11-12, 1978, at the Army Research Office in Research Triangle Park, North Carolina. The papers review the state of the art in statistical robustness and cover topics ranging from robust estimation to the robustness of residual displays and robust smoothing. The application of robust regression to trajectory data reduction is also discussed. Comprised of 14 chapters, this book begins with an introduction to robust estimation, paying particular attention to iteration schemes and error structure of estimators. Sensitivity and influence curves as well as their connection with jackknife estimates are described. The reader is then introduced to a simple analog of trimmed means that can be used for studying residuals from a robust point-of-view; a class of robust estimators (called P-estimators) based on the location and scale-invariant Pitman estimators of location; and robust estimation in the presence of outliers. Subsequent chapters deal with robust regression and its use to reduce trajectory data; tests for censoring of extreme values, especially when population distributions are incompletely defined; and robust estimation for time series autoregressions. This monograph should be of interest to mathematicians and statisticians.